One of the best things about our homegrown festivals is the opportunity to learn more about the local history. This week is Peace Week and the Honoka‘a People’s Theatre will be presenting Traditions and Family Values, a film with snippets of 15 oral histories of folks living just down the Hāmākua Coast from Honoka‘a, in Pa‘auilo Mauka Kalōpā. The film organizers loaned me a preview copy, though I can’t wait to see it on the big screen. The documentary starts with Hawai‘i as a land of immigrants, beginning with the first Polynesians. To thrive, the Hawaiians organized along a mountaintop-to-sea land system called Ahupua‘a. People who lived at the shore traded fish for lowland crops, hunters from the valleys traded pigs for wood from the upland forests. This exchange across different land types was a model for sustainability. 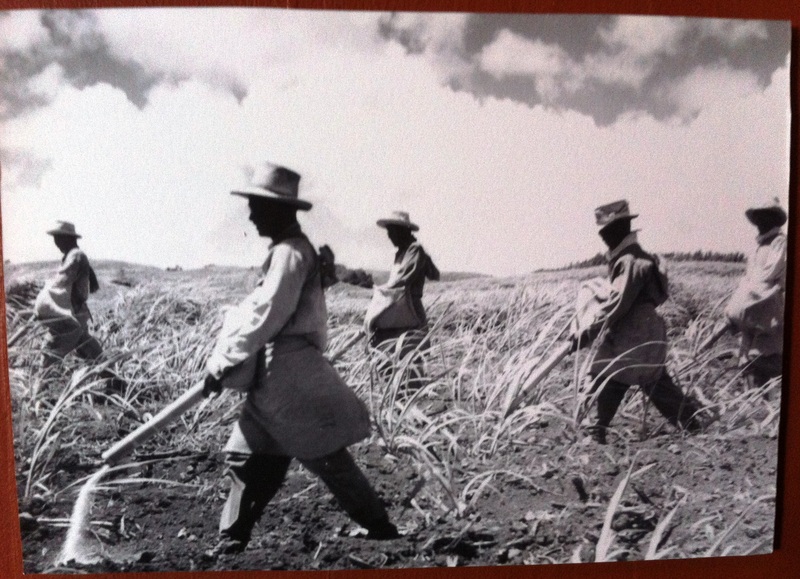 When the next wave of immigrants came, small sugar plantations began to dot the Hāmākua coast. These grew to large plantations which could not sustain themselves: they had to bring in indentured laborers to work the fields. The workers came in waves, living in plantation camps: Chinese (1850s), Japanese (1860’s), Portuguese (1870’s) Filipinos (early 1900s), and later, others. When the sugar plantations closed, hundreds of people lost their jobs which rippled through the local economy. A tiny woman, Dolores Ramos, reminisced about her early days ranching. They had to fix fences, brand the cattle, give them inoculations, and create ponds for water. “Branding was new to me at the time. I ended up helping with castrating bulls too. You just did the work.” Today she helps her grandson with the 172 acre ranch. Several of the people interviewed talked about self-sufficiency. Everyone had their own pigs, chickens and gardens. Locals made and still make their own sausage, smoking hand-stuffed casings and pork pieces in smokehouses. My favorite section of the film described hunting pigs. Sho Fukaura planted a mac nut orchard. He said, ”The pigs ate all my mac nuts that fell and just about wiped out one tree overnight; about 10 of them came through. We had to get rid of them. (One) year I shot 45.” But hunting didn’t just get rid of a nuisance; it put meat on the table. Waltham Johansen described three major organized hunts each year: Easter, summer and Christmas. At the end of the hunt, the slaughterhouse yard would be filled with 40 – 50 pigs. The hunters did not get their own pig back. Instead, slaughtered pigs would be given to the Catholic Church and the Japanese Buddhist Temple in Pa‘auilo, and from there the pigs were distributed to people in need, maybe a half or quarter pig. The remaining sections were distributed to the hunters and to those people who didn’t hunt but played their part in the community. Everybody’s share was just as good as everybody else’s. I don’t know much about pigs but I thought I knew a bit about fish. However, when fisherman Mike Crosson listed his favorite eating fish available off the Hāmākua Coast, I didn’t recognize any of them. Clearly I have some tasting work to do. He explained that ancient Hawaiians and modern locals alike fished from the Hāmākua cliffs, and some of the old trails to get there still follow the Ahupua‘a borders. Where you see a likely spot, he said to look for iron stakes for ropes and rope trails leading down. The plantations continued the access traditions of the Hawaiians and allowed fishing. People in the camps fed themselves by fishing, especially during strikes. Debbie Chang and Hugh Montgomery also talked about the old Ahupua‘a border trails. Today these trails are being blocked by private land-holders who do not understand the traditions. We are in danger of losing that access completely, despite the Highways Act of 1892, signed into law by Queen Lili‘uokalani, after she noticed how her people were increasingly having difficulties accessing the shores and the mountains to do their traditional hunting, fishing and gathering. There is world peace and then there is community and personal peace that can come from learning from and respecting your elders, accepting and relishing differences, and understanding traditions and history. This is a film about that kind of peace. Peace to you, this week and all weeks. This film was a project of the Pa‘auilo Mauka Kalōpā Community Association. This entry was posted in Hamakua, Hawaii ranching, Hawaii's melting pot - ethnic groups, Hawaiian history, Holidays and festivals, Honoring tradition, life choices, Plantation era, sustainability and tagged Pa‘auilo Mauka Kalōpā, Pa‘auilo Mauka Kalōpā Community Association, PMKCA, Traditions and Family Values: A Blueprint for Our Community Pa‘auilo Mauka Kalōpā. Bookmark the permalink. Thank you Lynn. I appreciate your comments.